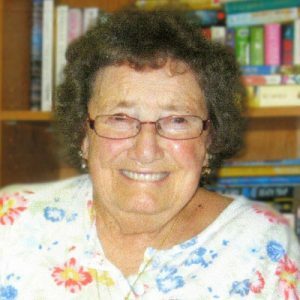 Shirley passed away on January 19, 2019 at the age of 84. She is survived by her daughters Jo-Anne Dooley, Carol Brown, Linda (Dave) Morrow and Pat Allnutt; son Howard (Trish) Allnutt; nine grandchildren; three great-grandchildren; sister Myrna (Rodney) Sullivan; and brother Darryl (Chris) Reid. Shirley is predeceased by her loving husband Sidney Allnutt and her parents Wilba and Lyle Reid. Shirley was born in Vancouver in 1934 and raised in both Vancouver and Sooke, BC. After High School in Kitsilano, she married the love of her life, Sid Allnutt. She spent the next 30 years raising her five children in Vancouver while working full time cooking in bakeries and cafeterias. In 1994, after Sid passed away, Shirley moved to Kelowna and opened Magpie Bed and Breakfast where she had the joy of feeding and taking care of her guests. After 10 years she retired, but continued cooking for friends and family. Shirley was a unique soul who loved to feed people. She was a loving mother and wife, generous with her time, food and love. A Celebration of Life will be held at a later date. In lieu of flowers, should family and friends so desire, memorial donations may be made to the Canadian Cancer Society, www.cancer.ca. Sorry to hear of Shirley’s passing. She was always very kind to me and I remember her fondly. I am very sorry to hear of Shirley’s passing. We had kept in contact after she left working at C U @ C Health Services in Vancouver.. I did get to visit her once when she moved to the Interior, shared emails and Christmas cards. Shirley was forever kind and generous, keeping everyone well fed in our office. Will miss you! RIP. Our deepest sympathy.